How do you mark your specialty merchandise? Can your employees easily identify themselves to others at a trade show? What do you use to label important files and mark important documents? Discounted Office Supply.com has the supplies you need to create an entirely new system. We carry everything from badge holders to label printers, and rubber stamps to tags. As your premier online retailer for janitorial and office supplies, we have the items you need to stock your business and home office. Buy label printers for your entire office, get badge holders for all of the attendees at your show or order labels for yourself. We serve the continental United States through our 36 geographically placed distribution centers to serve you. We take pride in our great pricing, huge selection and superior service. 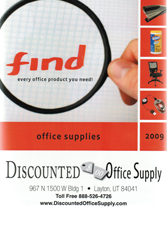 Browse the office supplies you need below.